Competency Based Ed is similar to the failed Outcome Based Ed fad from the 90′s. We all know that the federal agenda includes the dumbed down Common Core Standards and a return to the failed Outcome Based Ed Model of dumbed down workforce training. Included in the Competency Based Ed model, schools have begun switching their grading to the Competency based grading system. Since we can see this happening all over New Hampshire and beyond, it’s easy to see this is coming from more federal intrusion into our local public schools. The feds want to control what your kids eat at lunch, who they share the restroom with, control academic standards and testing, and even the way schools grade their students. Little is left for the local parents to control. Competency-based grading caused havoc in Nashua high schools. 92% of students want to get rid of it. 83% of parents want it gone. Even 54% of teachers prefer the old grading system. There were 25% less A’s and 25% more F’s under this new grading system. Competency-based grading is the stepping stone to the next State reform called PACE, which eliminates local control under the pretense of reducing testing and giving districts more control. When was the last State mandate that actually gave district more control over education? It’s important to remember that most of the competencies are “non-academic” skills. These skills are difficult if not impossible to grade objectively. For instance, if a child gets 2+2=4 correct on a test, that’s an objective grade. If that same student is graded on their attitudes towards global warming or if they can “collaborate” that is graded in a more subjective way. This new grading system means the grades may not reflect their academic knowledge but instead subjectively assess their attitudes, beliefs, values, dispositions, etc. It’s nice to see a letter instructing the administrators in Nashua to start listening to parents. Our hope is that at some point, they will actually take the advice they’ve been given. Nashua school administrators have a history of leaving parents, students and teachers out of the process when setting important initiatives. Competency-based grading was approved because board members were told that the grading system was mandatory. It wasn’t mandatory, but the policy was implemented. There were many complaints at the high school from students, parents, and teachers. The number of students failing classes has increased by 25 percent. The concerns of stakeholders were ignored. After dragging their feet for months, administration finally sent out a survey to parents, students and teachers. The result of the survey revealed overwhelmingly that stakeholders wanted to return to the traditional grading system. Administration is again choosing to ignore the community and to move ahead with this flawed grading system. School administrators routinely ignore stakeholders. Five years ago, parents and students expressed concern about block scheduling, specifically the lack of continuity for foreign language, math and science courses. Administrators offered skinny classes, but then claimed no students signed up. They never offered skinny classes again. A simple option would be to hold even and odd class days. Block scheduling is maintained, but students get the continuity needed for foreign language, math and science. That solves the problem and costs nothing. Administrators complain about the lack of parental involvement. Perhaps parents realize their opinions aren’t welcome. If administrators know best, why is Nashua South ranked 76th out of 77 in the state? Perhaps administrators should stop talking and start listening. Our students would be better served. This entry was posted in Miscellaneous, Parents and tagged CompetencyBasedEd, Federalcontrol, Grades, TracyPappas on May 8, 2016 by SCC. Thanks to Education Liberty Watch for notifying us of another way the Feds are gathering psychological data on our children. Make sure you REFUSE the Smarter Balanced, SAT, PACE assessments and the NAEP. This entry was posted in Data Mining, Parents, Smarter Balance and tagged NAEP, PACE, PsychologiclProfiling, SBAC, SmarterBalancedAssessment on May 5, 2016 by SCC. NH residents need to start asking themselves, when did they give up local control to the Commissioner of Education, Virginia Barry? Has our State Commissioner of Education overstepped her boundaries AGAIN? Who hires and fires the Superintendents? It’s not the Commissioner, and she has NO right to put our administrators in a position where they cannot share information with the people who pay their salary. The NH Dept. of Education is again, overstepping their authority and grabbing control away from local communities. We made the inquiry after State Board of Education Chair Tom Raffio told Sid Glassner, during his show Inside Education on this radio station, that the state had the assessment scoring and had sent it to school districts weeks ago. Glassner discussed it at length last Thursday during the Girard at Large “Is Our Children Learning?” segment. According to the state department of education, the scores were supposed to be released in July so districts could use the data to inform instruction in the coming school year. This entry was posted in Parents, Smarter Balance and tagged CommissionerBarry, GirardatLarge, RichardGirard, RightToKnowRequest, SmarterBalancedAssessment on September 22, 2015 by SCC. What is the purpose of public education? That is the question everyone needs to ask themselves. Is it for workforce development? Under the Common Core reform, we are seeing a radical shift away from a academic based education to dumbed down workforce development. Within this transformation we are seeing disturbing trends like the massive data collection on students. We are also witnessing another disturbing trend, and that is the shift to psychological services for students. The Associated Press recently reported that, “N.H. schools seek to address mental health issues among students.” But what does this mean for NH students attending a public school? So now our public schools that are transforming into dumbed down workforce training centers, will also provide psychological services too? Is anyone disturbed by this radical transformation? It’s important to note that a few local activists have been attempting to stop this radical transformation. For instance Michelle Levell wrote this article in 2013 when the New Hampshire Board of Ed mandated psychological services to students without parental consent. Levell highlights the problems in the proposed rules calling attention to psychological services that can be administered without parental consent, no “opt-out” provision, and no fiscal note identifying the costs involved. Parents need to begin the process of figuring out if their children can be treated without their knowledge or consent. If their children are evaluated and treated, what kind of privacy protections are in place? Where does the information gathered on their student go? Can a parent notify the school and request that their child NOT be evaluated or treated? In other words, can you opt your children out of any kind of psychological evaluation? What will this cost the local taxpayers? The New Hampshire Board of Education continually claims that all rules imposed on our local schools are derived from legislation passed by your local elected representatives. What legislation was passed in New Hampshire that gives authority to the APPOINTED Board of Ed Members to MANDATE this kind of treatment in our local schools? The American Psychological Association has a STRICT code of ethics. It is important for parents to fully understand the governing factors licensed medical professionals must follow when treating patients. 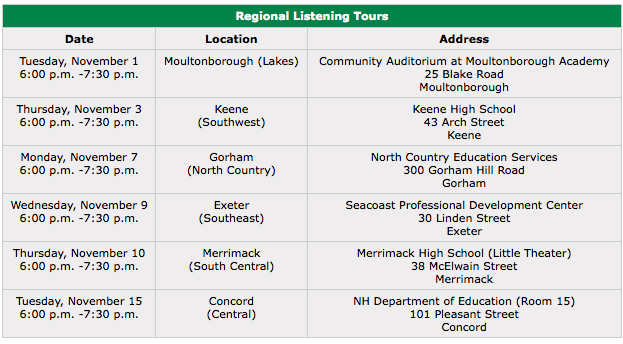 Are those who are treating students in New Hampshire licensed medical professionals? Do they follow the strict code of ethics when treating students? We know that our schools are administering psychometric assessments without parental permission and currently ignoring the APA code of ethics. If school administrators are willing to ignore the code of ethics when testing your children, would they ignore the code of ethics when treating your children for mental illness? Should our public schools now become the hub for social services? Or should they go back to focusing on educating our children? We understand that there are going to be children who need social services who may not have access to needed treatment. Schools can certainly guide families to those services if needed. However changing the make-up of public education in such a radical way will only further dilute the academic foundation our children need and deserve. If your child breaks their arm the parent is notified and the child is then taken by the parent to seek medical attention from licensed medical professionals. The local school is not in the business of administering medical treatment to children. That is not their mission. So why are we allowing our local schools to become mental health facilities for our children? This entry was posted in Miscellaneous, Parents and tagged Ed306, MentalHealth, MichelleLevell on August 25, 2015 by SCC.